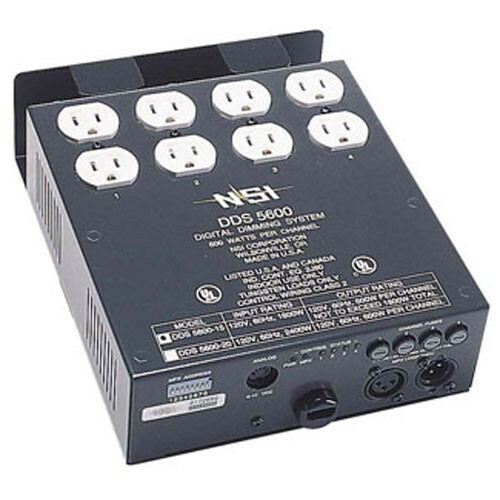 The NSI DDS5600 4 channel, 2400 watt total Satellite Dimmer Pack has 4 individual Dimmer/Relay Channels. Its dual SCR circuit design ensures reliable operation. It has a 20 amp, 120 volt circuit breaker. Its AC power plug is 120 volt, NEMA 5-20, with perpendicular blades. Toroidal filtering reduces audio interference and extends lamp life. The sequence rate is adjustable from 1 to 60 seconds. It also features as user-select switch for Dimmer or Relay operation. The DDS5600 comes with NSI's 128 channel microplex (3 pin XLR) connection. An optional DMX512 digital control (5 pin XLR) interface is available. The reversible back cover allows the dimmer pack to be truss or pipe mounted. Internal jumpers activate 8 auto sequence control programs. Box Dimensions (LxWxH) 13.2 x 11.5 x 9.4"